New Jersey hunters enjoy many types of hunting, numerous days afield and generous bag limits. But development and other human encroachment on the forests and fields of the Garden State has changed both wildlife habitat and land suitable for hunting, such that SAFETY ZONE awareness is even more critical for hunters. 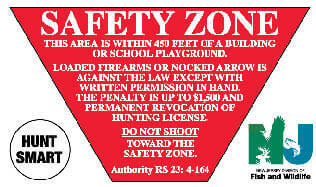 The firearm SAFETY ZONE is the area within 450 feet of a building or school playground, even if not occupied. For bowhunters, the SAFETY ZONE around buildings is 150 feet but remains 450 feet from a school playground. See Safety Zone, General Hunting Regulations. The SAFETY ZONE is the place where you, the hunter, cannot carry a loaded firearm or nocked arrow unless you have written permission in hand. The SAFETY ZONE was established by legislation in 1946 as an area to place some physical distance, a buffer, between hunters and homeowners. The SAFETY ZONE could be land where there is suitable wildlife ­habitat for adaptable species, like the white-tailed deer, cottontail rabbit and Canada goose. The SAFETY ZONE is not a magic shield and cannot stop a misdirected projectile from entering the area around a home. What can you do to heighten your SAFETY ZONE awareness? Scout hunting property annually to be aware of new construction or other changes. Hunt SMART and remind your hunting partners to Hunt SMART. Know the law. Know the land. Remember, failure to hunt safely and responsibly is inexcusable. Always be a responsible hunter. Always be aware of your surroundings, the target and what may lie beyond the target. The principles of good conduct learned at your hunter education course are called into practice every time you hunt. Take special care hunting on “high visibility” property, habitat where our adaptable wildlife species—especially white-tailed deer—are ­flourishing. Here, hunter conduct will be watched closely; the image we portray can have a great impact on the tolerance for our sport. Hunting these Special Areas carries added responsibility for you, as a hunter, to ­exercise restraint and make superior judgment decisions. Hunting on national wildlife refuges is not permitted unless specifically opened as listed below. No Sunday hunting on national wildlife refuges. Deer—Special Areas Hunting Season Information. Turkey, rabbit and squirrel hunting in select areas only. No refuge permit is required. Special hunting conditions apply. Contact refuge office for information. In addition to required state licenses and permits, hunters must obtain a Refuge permit for $26 ($13 for holders of a Senior, Golden Age, Access, or Golden Access pass and youths with a valid New Jersey youth hunting license). Information can be obtained at the refuge, at ­dispensers, at the headquarters, on the refuge website, or through the mail. Deer—Bowhunting only. Special Areas Hunting Season Information. Special hunting conditions apply. Contact refuge office for information. Note: the refuge is closed to Sunday hunting. In addition to required state licenses, hunters must purchase a Refuge hunt permit(s) at https://wallkillriver.recaccess.com (Discounts for Senior, Golden Age, Access, or Golden Access pass and youths with a valid New Jersey youth hunting license). Hunters with Disabling Conditions: A Disabled Hunter Area exists at 119 Owens Station Rd. Sussex, NJ (see refuge hunt map). Hunters must possess a valid NJ Permit to Hunt or Shoot from a Stationary Vehicle in addition to the Disabled Refuge Hunt Permit. Mentored Hunts: The refuge partners with the National Wild Turkey Federation to offer mentored hunts for youth, women and disabled hunters. Registration is required and space is limited. Contact the refuge for dates and details.